11/7-8 ~ A Twilight Challenge! Note: For those living in San Francisco this New Moon takes place below the western horizon about 4 hours after sunset. The Sun, New Moon and planets are located in the same constellations for other parts of the world; these constellations, in differing time zones, lie in a different location above or below the horizon. The New Moon and Sun conjoin Libras two brightest stars Zubeneschamali and Zubenelgenubi. The Zuben stars of Libra were originally the pincer claws of the cosmic Scorpion, Scorpius. The name Zubenelgenubi derives from an Arabic phrase meaning the "Scorpion's southern claw" The star above it, Zubeneschamali means the northern claw. Zubenelgenubi, the southern claw, has a dual character. It can stimulate revenge or help heal a relationship. This star has a karmic quality, revealing our past patterns of behavior. Zubeneschamali, the northern claw, arouses spiritual and mental focus. It is beneficent and aligns us with permanent happiness. Its quality is dharmic, reconciling the past, moving us into the future. As seen in the map above, the two Zuben stars form a triangle with, Dschubba, the head of the cosmic Scorpion. Mercury lies on the southern line of this triangle. Dschubba is the administrative seat determining the karmic / dharmic path of involvement for the incarnating soul, based on souls' experiential growth. Mercury illuminates the higher mind, creating a link between the soul and the personality. Mercury assists in giving birth to Divine messengers. Venus, positioned at the upper legs of Virgo, is technically in the constellation Libra. See map above. The boundaries of these constellations are shown in The Sidereal Heavens. This New Moon is uniquely tied in with Venus retrograde [*] [10/8-11/17]. The degree of this lunation is the same degree where Venus "turned" retrograde on October 8. Also, on the day before the New Moon, Venus rises as a morning star and is considered to be extremely potent. ... Be aware of impulsive, destructive behavior. Drop away the old stories that affirm regret and negative self worth. This is when we may really see where we are and what's ahead regarding values, personal power and transformation. The heliacal rising [*] of Venus completes the Aries cycle begun on April 3, 2009 and begins a new cycle in [the sign of] Scorpio which completes at the next heliacal rising in [the sign of] Gemini during the next retrograde in June, 2012. A new cycle of spiritual birth with its karmic and dharmic challenges is being emphasized. Today, our choices and alignment are more important than ever. The Heavens are presently calling us to balance the scales, to find a harmony between spirit and matter, to cultivate equilibrium and know equipoise, to be the soul manifest on Earth. Wounded and conflicted karmic relationships are bound to show themselves during this lunar cycle. Dharmic responsibility, close at hand, is destined to tap us on the shoulder for a reconciliation of them. Polarities, both sides of the coin, must be honored and balanced through wise loving actions and conscious choices. Seeking truth, yielding on all non-essentials and finding common ground are required now. The "missing claws" of Scorpius have become Libra, the razor edged path of the soul. Treading this path is challenging however, commitment to the journey brings forth the "cutting edge" ideas that transform our world. Ponder Transcendence during this lunar cycle. It marks the next major phase in the manifestation of humanity's soul on Earth. Full Moon during Scorpio, begins with this New Moon. November 3-7, Friday-Tuesday, the 5-day Diwali Festival of Lights is in progress. It celebrates the victory of good over evil and the lifting of spiritual darkness. The first 2 days are preparatory to the third New Moon Frestival Day; 2 days of celebration follow. Note: Daylight Saving Time ends for most of North America Sunday morning, November 7, at 2:00am. Set your clocks back an hour. 'Tis the season to "fall back" an hour. Sunday morning November 7 at 5:45am. What are my self-defeating habits that extinguish my life force? What is dying and passing from my life and what is struggling to be born? Humanity's consciousness of the soul's everlasting life leads the personality to a fiery death and ascension, evolution's spiral dance. Play your part well during these times of transition, transformation and transcendence. Note: Gibbous Luna can be seen near brilliant Jupiter and binocular Uranus the night of November 15 and is in exact conjunction with this planetary pair early November 16. Learn more below. Overcoming obstacles to the new incoming awareness begins with the waxing Crescent Moon. What was conceived at the New Moon, Poised Balance ~ A Conscious Choice and Challenge, (review above) is now in the process of waxing or gestating. November 8-10, Monday-Wednesday, Luna grows in the realm of the Archer. The Sagittarian Archer with Pluto on his bow takes aim, zeroes in on the Light and Whole Truth and knows the way to go. He is adept at piercing the veil of falsehood and unifying dualities into a balanced whole. He teaches us to aim the arrow of the mind toward the intuition. Open to the emanations of this heavenly Archer when choices become challenging. Use the following Sky Chart to track Luna's journey through the constellation Sagittarius. 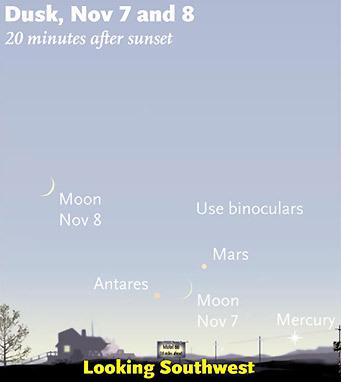 Note: November 8 presents a twilight challenge in seeing Mars, Mercury and Antares the heart of the Scorpion; binoculars are helpful. Review this star map and the Reflections ~ Mars, Mercury, Scorpius found above. Note: Use your imagination to mark the location point in our sky of the New Horizons Pluto-bound spacecraft, which lies in the vicinity of the Moon, between Pluto and the top of the Archer's teapot. New Horizons was launched January 2006 and is scheduled to reach Pluto July 2015. Luna swims and grows in the dark pool of the heavens filled with watery constellations and dim stars. Some call this the Celestial Sea.. Look Up! Luna and Jupiter stand out, making quite a striking pair in these dark waters. Watch the distance between them decrease, then increase. Get out those binoculars for a great view of Luna and her terminator, the shadow line dividing the lunar day from lunar night. It is here that sunrise occurs on a waxing Moon. Lunar craters, mountains and valleys are accentuated along this line of contrasting light. As the hours pass, follow Jupiter and Luna west into the morning sky. Jupiter sets around 2:00am. Luna sets a little after midnight November 13 and around 3:00am November 18. Be sure to look for Luna in the day sky! Can you find her each day in the daylight hours? You'll need a telescope to view Neptune. Uranus can now be seen with binoculars and without an optical aid in a dark country sky. One can draw a diagonal line from brilliant Jupiter toward the southwestern horizon to Fomalhaut, the Southern Royal Star. Look for the nightly shapeshifting triangle formed by Luna, Jupiter and Fomalhaut. This nightly triangle is easily seen November 13-18. It is formed by Luna, Fomalhaut and Jupiter. Review map above. Jupiter joined by binocular Uranus in this triangle stimulates BIG change, which can initially throw us off balance, but ultimately serves humanity. Luna reminds us that poised balance can be challenging and must be a conscious choice. Look Up! Imagine this shapeshifting Celestial Sea triangle streaming forth energies that help humanity learn something new and wholesome, while we move with the seemingly chaotic currents and waves of our times. The First Quarter Moon, exact Saturday, November 13, at 8:39am PST (16:39 UT) squares the Sun at a 90-degree angle and brings up a tension between desires and emotions, as we struggle for fulfillment. Ideally any obstacles impeding the awareness conceived at the New Moon are overcome at this time. November 13, Saturday, Neptune the sea god welcomes First Quarter Luna at the northeastern border of "smiling" Capricornus, the constellation of the sea goat. Review map above. The emanations of Capricornus support a new cycle of effort, one with immense spiritual possibilities, one that gives full expression to the earthly nature. Capricornus can open the doorway to the head center and bestow humanity with divine vision and purpose. Telescopic Neptune in this constellation helps us by aiding the creation or rebuilding of structures that manifest our dreams, our spirit on Earth. The sea god can help us achieve poised balance, while the sea goat can help us realize new choices. Note: Luna exactly conjoins Neptune 11/13 at 6:11pm PST (02:11 UT 11/14). November 14, Sunday, Luna enters the depths of Aquarius the Water Bearer whose water jug provides nourishment for the Southern Fish and Royal Star, Fomalhaut. Review map above. Ponder these Aquarian keywords of the soul: "Water of life am I, poured forth for a thirsty world." Drink up! November 15, Monday, Gibbous Luna and Jupiter pair up at the eastern border of Aquarius. Review map above. Like the Southern Fish Fomalhaut, drink the "Water of Life" poured forth by Aquarius. Ask how you can serve the soul. What choices can you make that create a wholesome human condition? November 16-18, Tuesday-Thursday, Luna swims with the two fishes of Pisces and the whale Cetus, also known as the Sea Monster! Unpredictable Uranus is lurking in these waters and making BIG waves with wise, beneficent Jupiter. Review map above. 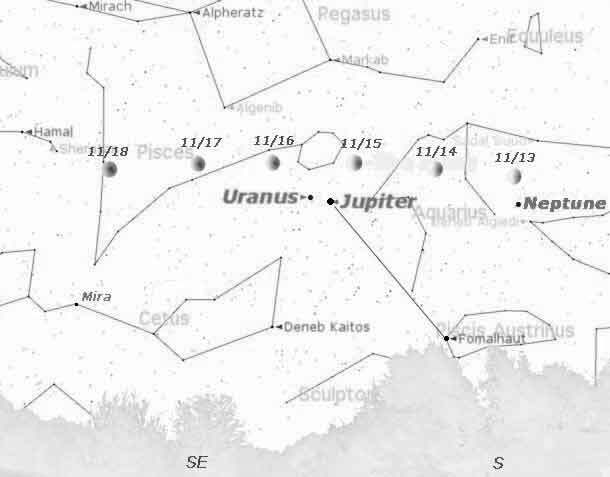 Note: November 16 Luna exactly conjoins Jupiter at 1:55am PST (9:55 UT) and Uranus at 8:37am PST (16:37 UT). The fusion or union of the Pisces fishes, matter and spirit, produces the Incarnated Christ, the perfected individual soul. In this process the lesser and greater polar opposites — the human being and God — are brought to their destined, radiantly divine expression, the HU-man * world savior. Is Cetus a whale or a monster? Is the whale's tail the monster's jaws or is the monster's tail the whale's head? Cetus Image The whale is an ancient symbol for creation; many myths speak of how human life sprang from the sea. On the other hand Cetus the Sea Monster represents destruction. Hmmm ... Cetus represents the human struggle, that of a spiritual being in human form—creation, destruction and evolution. The rough seas and the "Waters of Life" are here to awaken humanity to its soul, a point of balance where earthly desire fuses with spiritual love. Its a Visual Banquet ~ Bon Appétit! Dated Spheres represent the approximate position of the Moon on the given dates. Position of the Moon varies from night to night. 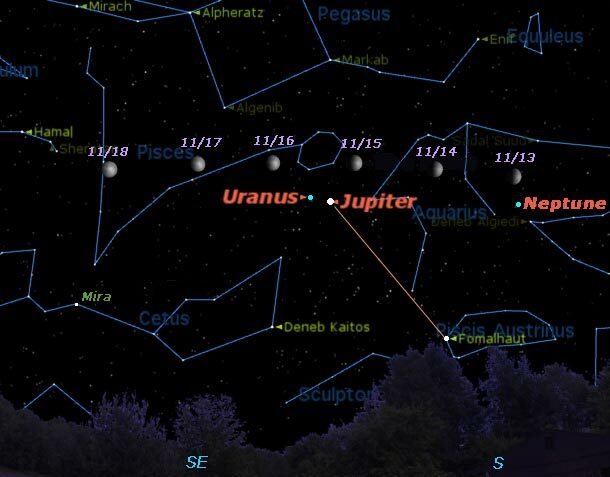 By December's end Jupiter has moved very near Uranus. The stars overhead change as the seasons change on Earth. The stars highest above the horizon mid-evening are considered to be the stars of the season. Look west to see the 3 brilliant stars of the Summer Triangle slowly descending toward the horizon. This transformational gateway lies over the Milky Way, leading one on the path of the gods. Almost overhead are the four much dimmer stars, which make up the Great Square of Pegasus the Flying Horse, the Autumn Square, the "Doorway to Paradise." To the east of Pegasus lie autumns sparkling blue mini dipper-shaped Pleiades. Note: The Celestial Sea is located on the southern horizon below Pegasus. Look east to see Orion the Hunter, winters cosmic giant, rising over the horizon at 8:00pm during the first two weeks of December, a sure sign that winter is near. Note: The winter stars are some of the brightest stars in the heavens. Many may have originated in the Orion Nebula, a stellar nursery located in the sword of Orion. What was conceived at the New Moon, Poised Balance ~ A Conscious Choice and Challenge, review above now comes to fruition and is birthed into the full light of our conscious minds. Since the exact Full Moon occurs early Sunday, we get to observe a very FULL Luna Saturday and Sunday evening, November 20 and 21. The exact Full Moon lies in the constellation Taurus the Bull, and conjoins the blue-white Pleiades star cluster marking the Bull's shoulder. Saturday evening Luna approaches the cluster from the west; Sunday evening Luna is east of the cluster, near the reddish star of enlightenment, Aldebaran, which marks the Bull's eye. Compare this constellation image to the map above. Note: Moonlight veils the sparking Pleiades. Binoculars come in handy seeing the cluster and are a special treat in observing Luna. Taurus helps us achieve poised balance on the teeter totter of life by enlightening our mind, however to receive this celestial illumination we must choose to transform desire into spiritual aspiration. This is a challenge. The Pleiades, also known as the Seven Sisters, are intimately linked to Sirius, our Earth, humanity and the higher aspect of mind. The emanations of the Pleiades seed the vision of Aldebaran, which in turn holds a divine ideal that can aid humanity's evolutionary process through its political systems, its nations. The cosmic Scorpion influences a turning point in the life of humanity and in the life of the individual human being. It reorients the personality to the life of the soul and later to initiation and sensitivity to the Divine Plan. The Scorpion helps us attune to the three lights of form, soul and life, which meet, blend and rise. to shed the old skin. the high soaring Eagle with the Vision. The Full Moon is taking humanity beyond the personality into the realms of soul and spirit. Humanity's consciousness of everlasting Life leads the personality to a fiery death and ascension, the spiral dance of evolution. With turbulent rhythms we learn to spiritually aspire and then achieve various levels of illumination and enlightenment. Our challenges and choices in this evolutionary dance ultimately lead us to a place of poised balance. During these teeter totter times of transition, transformation and transcendence, know that death leads to rebirth. The Phoenix rises from the burning ground. Take some time to imagine the illuminating light of the Pleiades and Aldebaran descending on Earth, guiding global governance on all levels. November 22, Monday, Luna completes her journey with Taurus the Bull when she approaches his northern horn tip, the star Elnath. Review map above. As we observe Elnath, we are looking toward the rim of our galaxy and the less-populated regions of intergalactic space, away from the crowded galactic hub. Tune to Elnath for perseverance and breakthroughs. Free yourself from the influences that limit the expression of your divinity. November 23-25, Tuesday-Thanksgiving Thursday, a waning Gibbous Luna transits the constellation of the Gemini Twins. Review map above. Tuesday she lies at their feet, Wednesday at their hips and Thanksgiving Thursday at their heads. Call upon the Twins to manifest a new cooperative spirit on Earth, one that strengthens the connection and communication between the personality and soul, one that creates equipoise. Imagine the twin flames of humanity uniting in the heart. Give thanks. Note: Nearby Betelgeuse, the red shoulder star of Orion (see map above), helps those who are spiritually attuned by stimulating the heart center, hence increasing compassion, cooperation and planetary service. What the soul is to the human, Betelgeuse is to our solar system. The curved yellow line represents the east-southeastern horizon. The dated circles show the approximate position of the waning Crescent Moon. Note: Yellowish Saturn our Lord of the Rings, is positioned west of (above) bluish Spica the brightest star in the constellation Virgo the Virgin; the much brighter golden Arcturus in Bootes lies north (left) of Saturn. Blazing luminous Venus, the goddess of love, lies east of (below) Spica; Venus is so bright now it can be seen after sunrise! You won't want to miss this breathtaking wonder in the morning sky. Saturn rises at 2:30am and Venus rises around 4:00am. BTW: Blue-white Regulus, the heart star and brightest star of Leo the Lion, lies west of (above) Saturn. Denebola, Leo's tail star is much dimmer. November 30, Tuesday morning, waning Crescent Luna lies between Regulus and Saturn; dim Porrima lies above Saturn. Review map above. Porrima may be difficult to spot without binoculars. Blue-white Regulus, yellowish Saturn and bluish Spica are about the same brightness. Binoculars make their colors vivid. December 1, Wednesday morning, slender Luna guides us to Saturn. Look for the planet to the left of the Moon. Review map above. December 2, Thursday morning, the incredibly bright celestial body next to slim Luna is not a UFO! It's Venus shining at its brightest now. Both the planet and Crescent Moon lie at the legs of the Virgin, which are a challenge to see. You won't have any trouble seeing Venus and Luna, the elegant pair will "WOW" you. They form a heavenly triangle with dimmer Spica. Saturn lies above this triad. Review map above. Bluish Spica and yellowish Saturn appear equally bright, Binoculars bring out their subtle hues. Note: Hanukkah begins today. Morning Luna, Virgo the Virgin, Saturn Lord of the Rings and Venus goddess of love awaken humanity from its slumber. The emanations of Virgo, our Heavenly Holy Grail, nurture our innate divinity, spiritual awareness and Christ consciousness until it can be made manifest, ultimately giving rise to the HU-man *, the God-man, the Christed ONE. The Moon, esoteric ruler of Virgo, when located in the Virgin's constellation, helps humankind become conscious of its great potential, world service. A deep growing awareness of the importance of service on Earth is affirmed and fostered by Virgo the Virgin. Porrima, Virgo's star named after the goddess of childbirth and prophecy, emphasizes new beginnings and the use of guiding intuition during change and its birthing process. Spica symbolizing the sacred womb of the Virgin, accepts and nourishes the seed of divine will from Arcturus, the savior avatar. Helpful Star Map This seed of divinity resides in Virgo and therefore within humanity. Saturn in the Holy Grail conceives the structures that exteriorize the unfolding Christ consciousness. These structures cultivate synthesis and serve in a healing capacity. Corvus, in alignment with Arcturus and Virgo, assures us of our essential divinity and its everyday guiding voice. See map above. This 3-day transit of morning Luna is enlivening humanity's innate divinity and stimulating pathways for divine energies to be made manifest on Earth. The Higher Power within each and every one of us is being aroused. We are the sacred Chalice for the Divine Host on Earth. This lunar cycle is ending. Remember, achieving a poised balance on life's teetor totter is challenging and requires yielding to the greater power of the Spiritual Presence. Listen, observe the signs found all around, use your intuition and make conscious choices. Play your part well! Celebrate HU-manity's * birthing process. December 5, Sunday, a New Moon occurs at 9:36am PST (17:36 UT). Stay tuned for the next edition of Moon Dances.